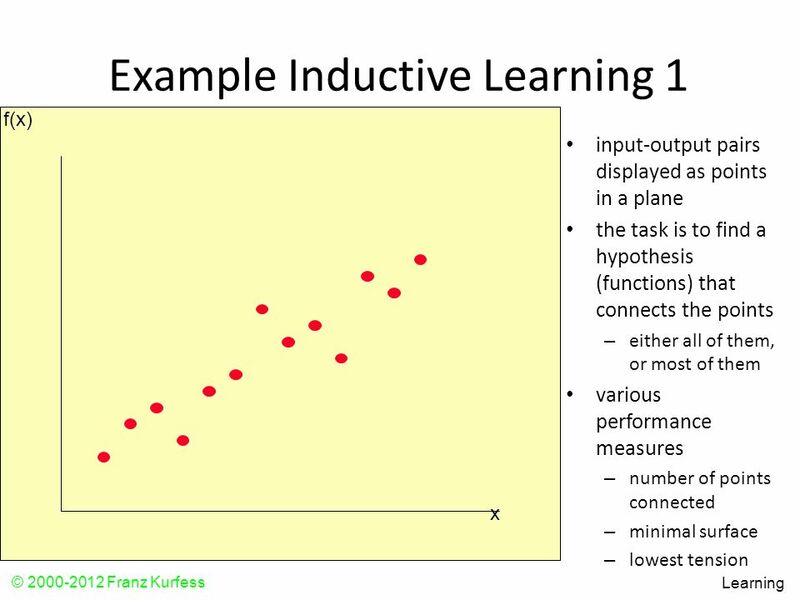 Learning complex concepts using Induction procedures typically requires a substantial number of training instances. 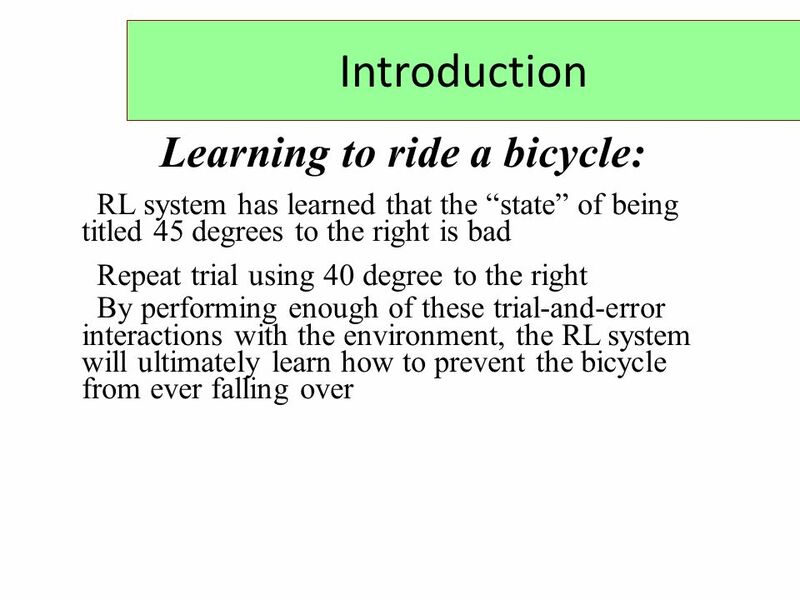 But people seem to be able to learn quite a bit from single examples. 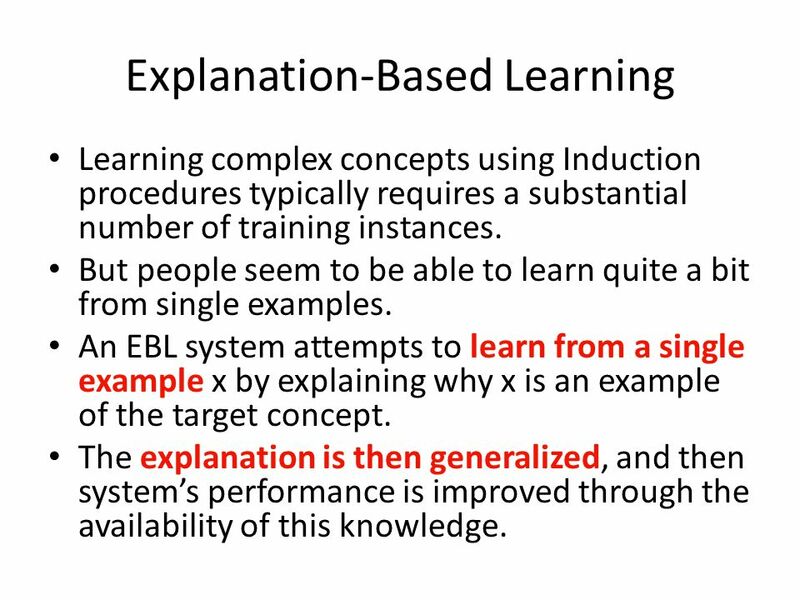 An EBL system attempts to learn from a single example x by explaining why x is an example of the target concept. 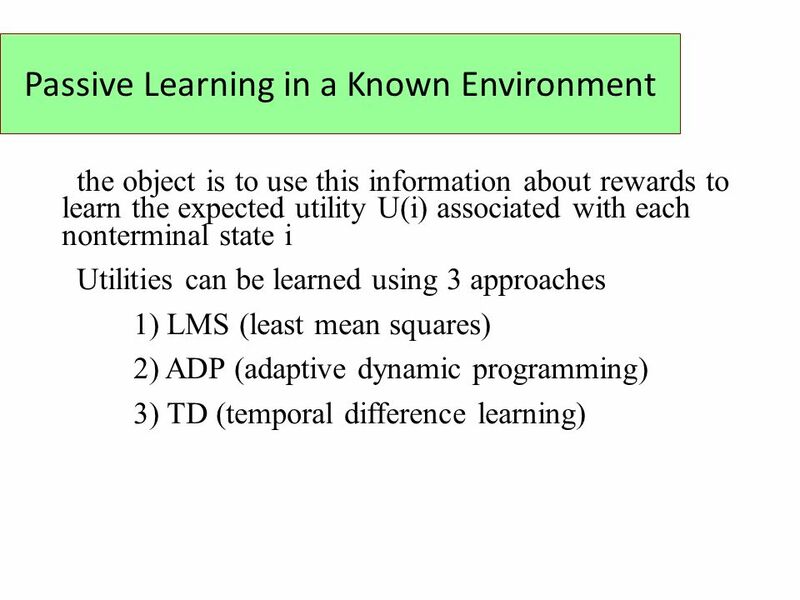 The explanation is then generalized, and then system’s performance is improved through the availability of this knowledge. 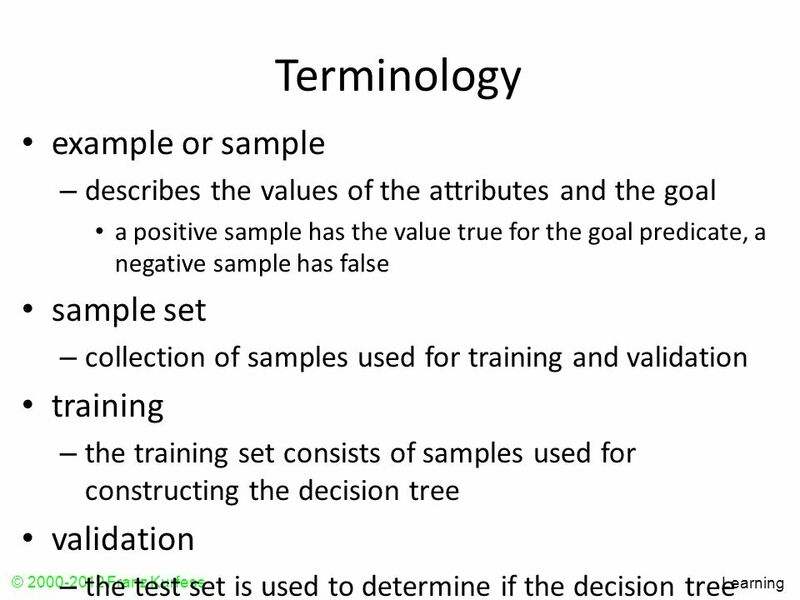 A training example A goal concept: A high level description of what the program is supposed to learn An operational criterion- A description of which concepts are usable. 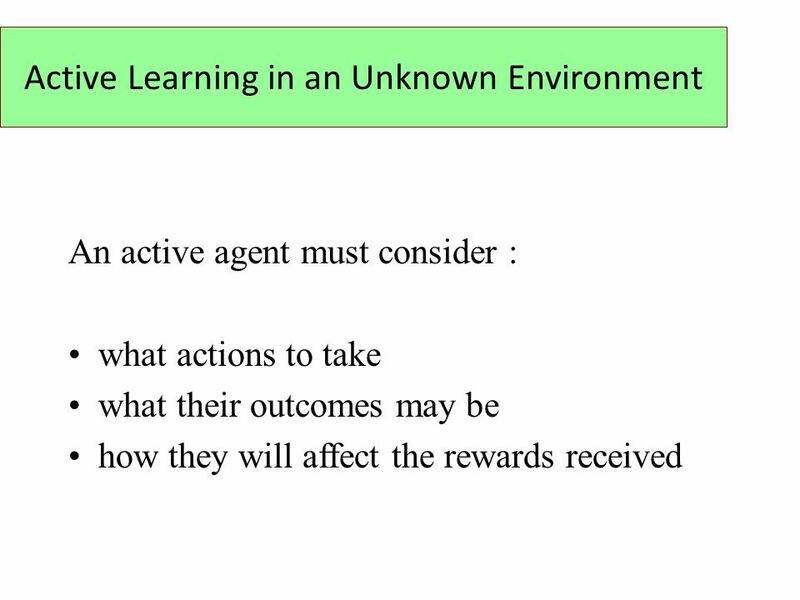 A domain theory: A set of rules that describe relationships between objects and actions in a domain. 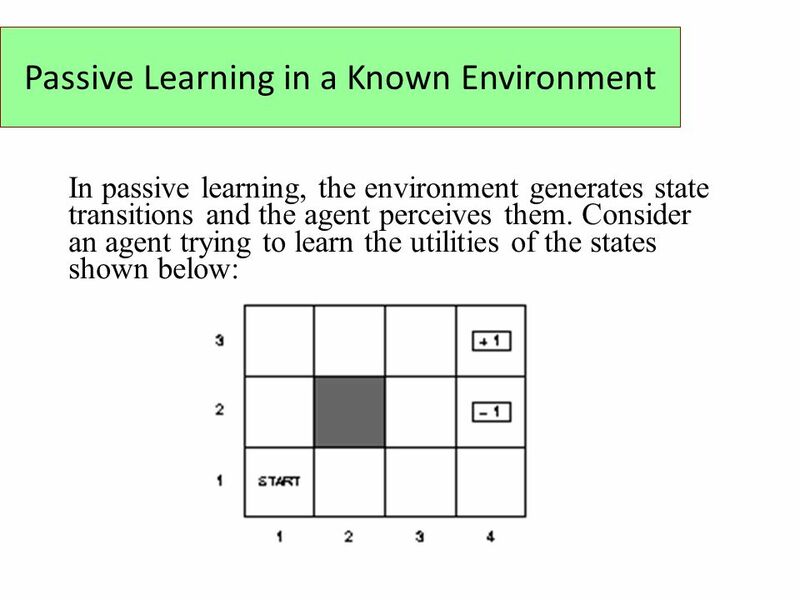 From this EBL computes a generalization of the training example that is sufficient to describe the goal concept, and also satisfies the operationality criterion. 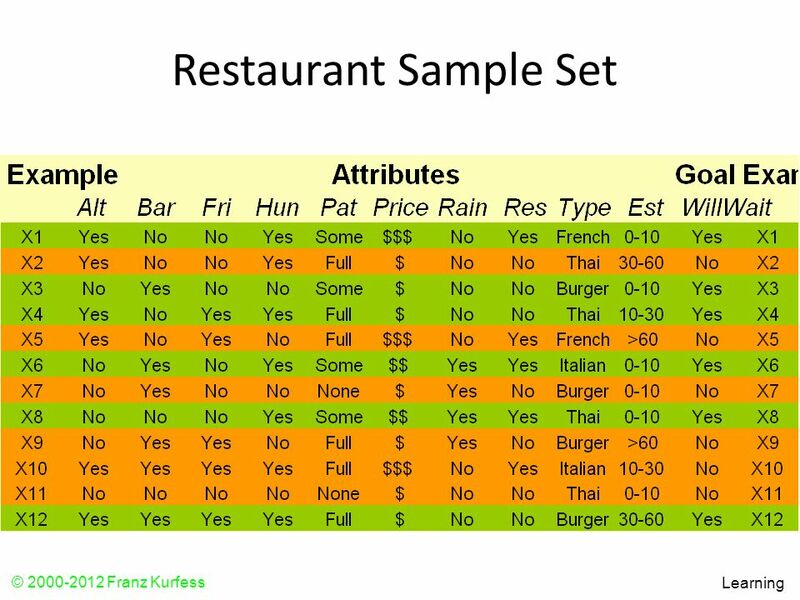 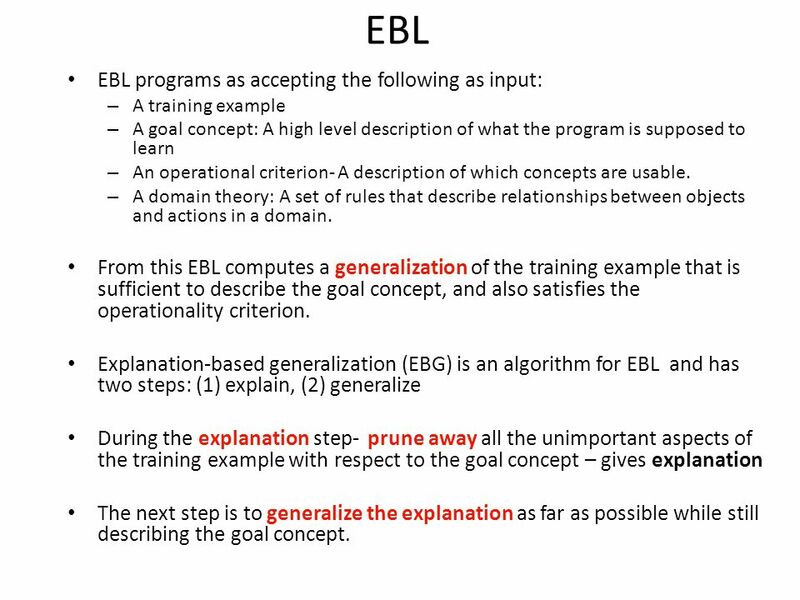 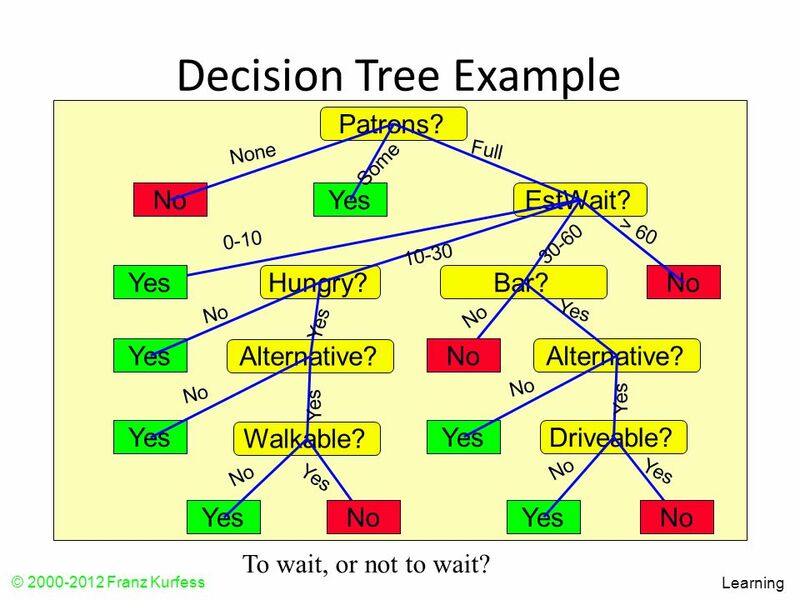 Explanation-based generalization (EBG) is an algorithm for EBL and has two steps: (1) explain, (2) generalize During the explanation step- prune away all the unimportant aspects of the training example with respect to the goal concept – gives explanation The next step is to generalize the explanation as far as possible while still describing the goal concept. 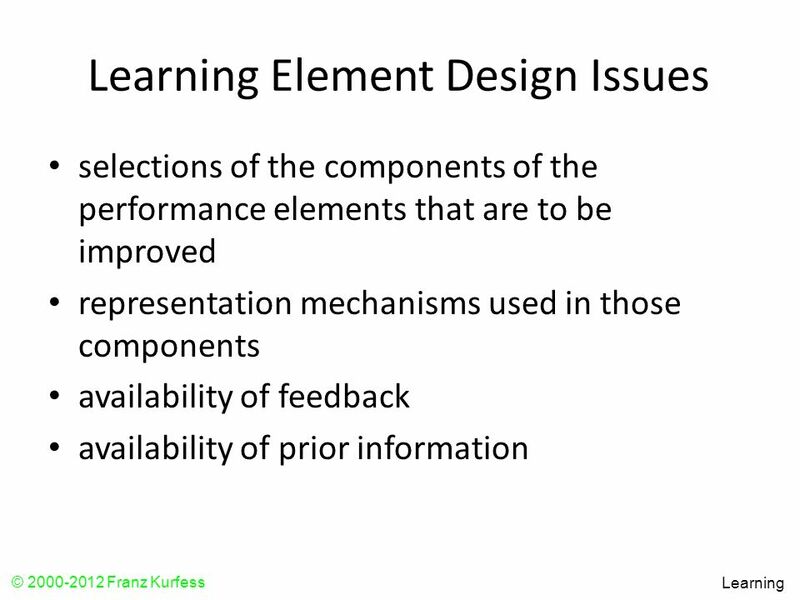 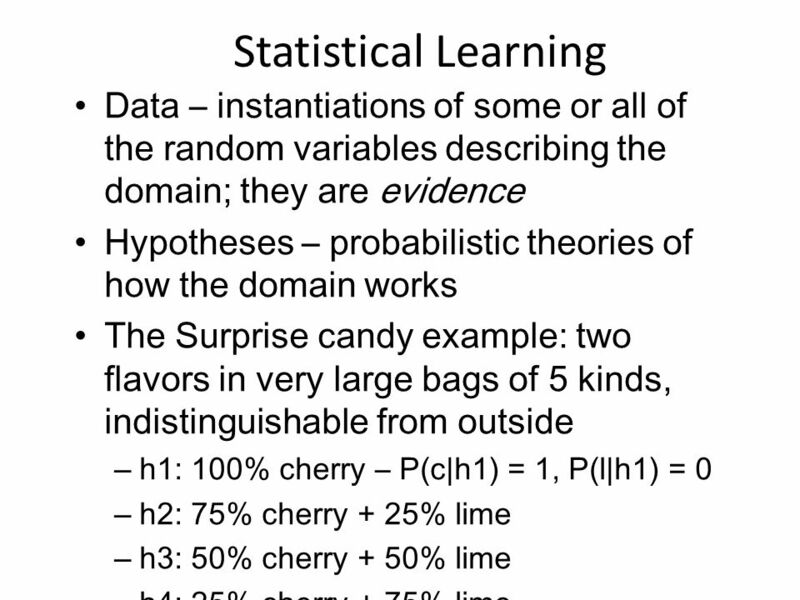 Many real-world problems have hidden variables which are not observable in the data available for learning. 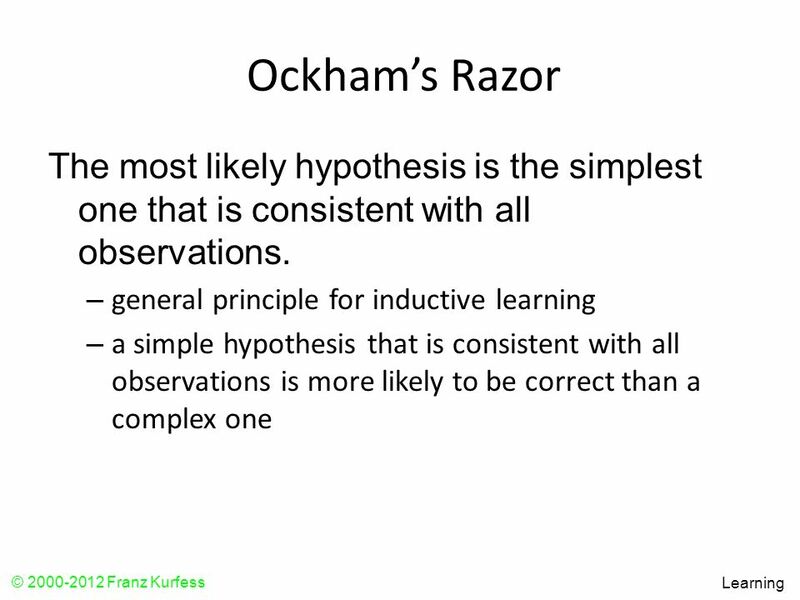 Question: If a variable (disease) is not observed, why not construct a model without it? 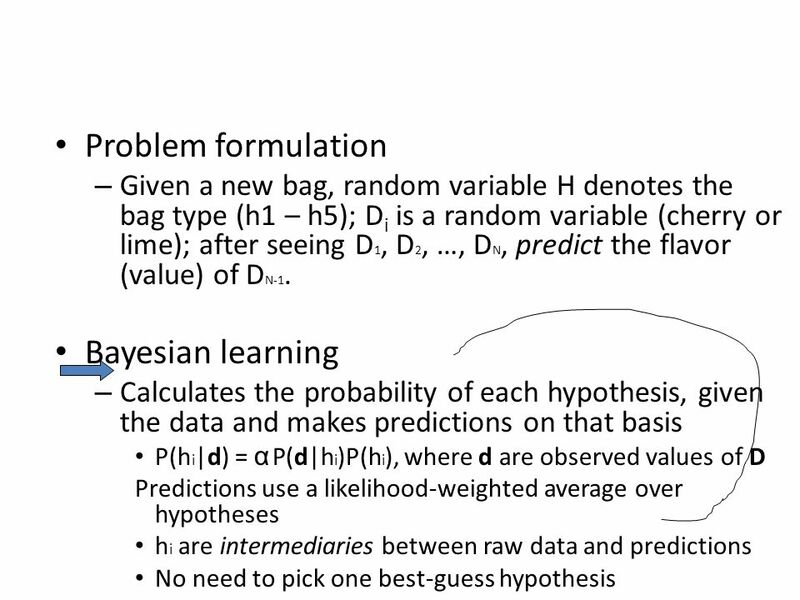 Answer: Hidden variables can dramatically reduce the number of parameters required to specify a Bayesian network. 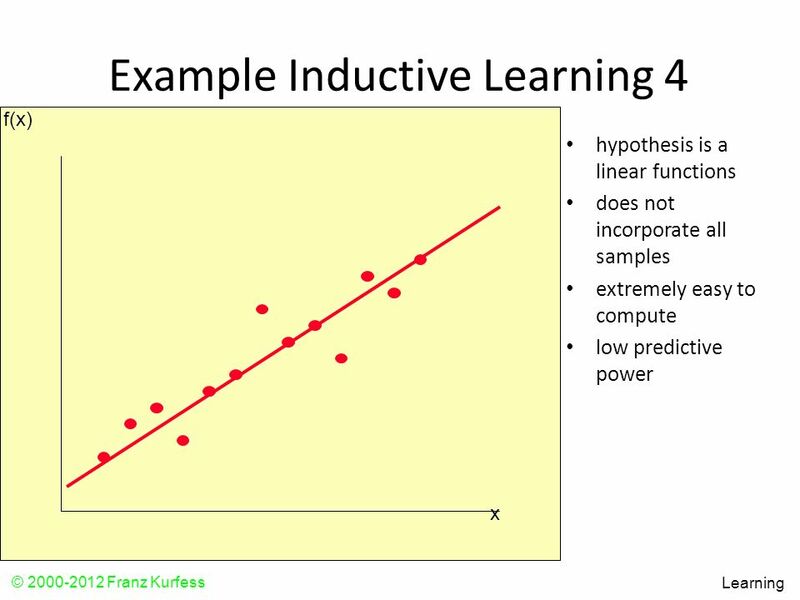 This results in the reduction of needed amount of data for learning. 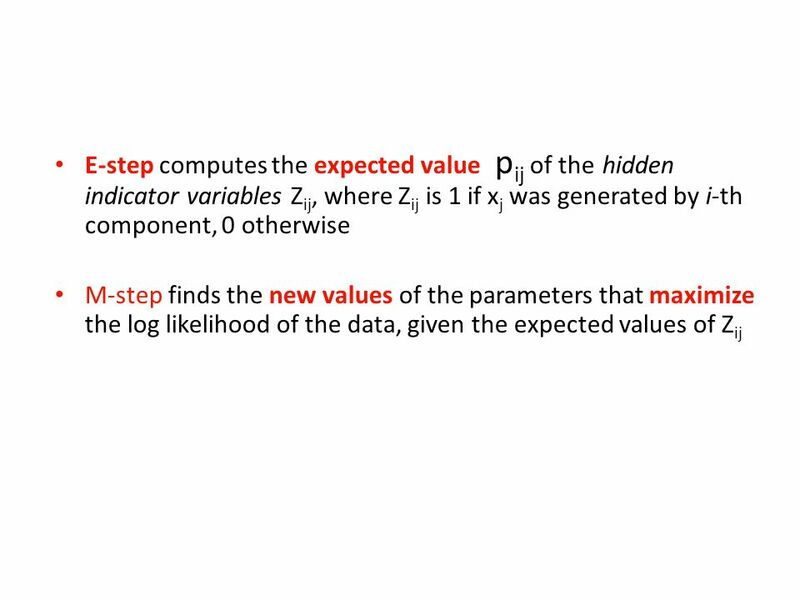 The unsupervised clustering problem If we knew which component generated each xj, we can get , If we knew the parameters of each component, we know which ci should xj belong to. 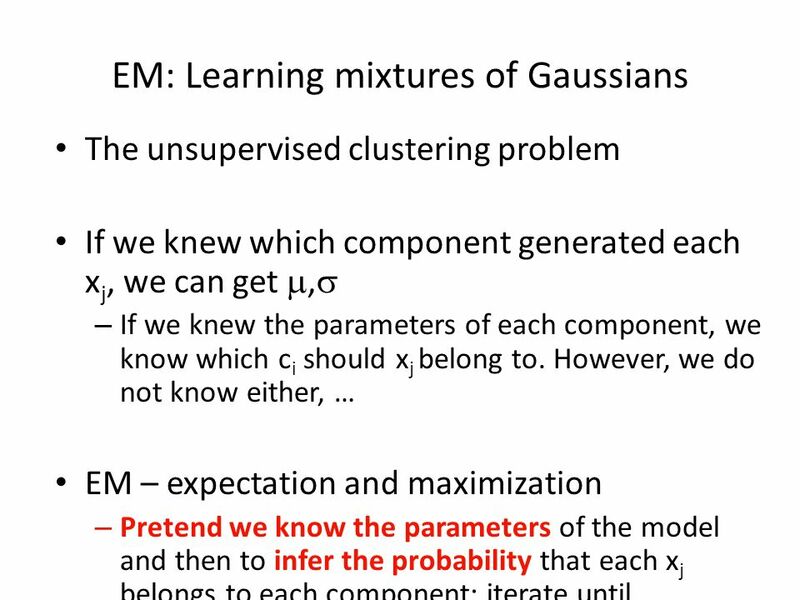 However, we do not know either, … EM – expectation and maximization Pretend we know the parameters of the model and then to infer the probability that each xj belongs to each component; iterate until convergence. 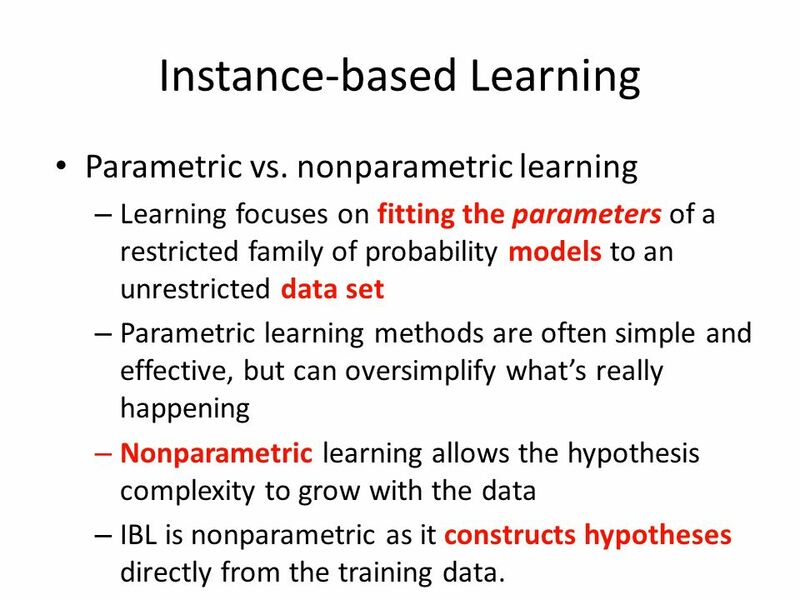 Parametric vs. nonparametric learning Learning focuses on fitting the parameters of a restricted family of probability models to an unrestricted data set Parametric learning methods are often simple and effective, but can oversimplify what’s really happening Nonparametric learning allows the hypothesis complexity to grow with the data IBL is nonparametric as it constructs hypotheses directly from the training data. 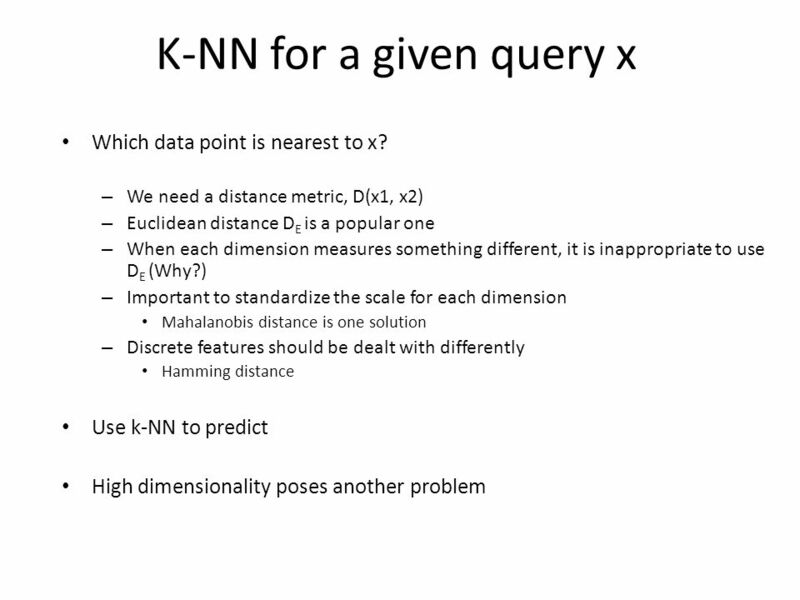 48 K-NN for a given query x Which data point is nearest to x? 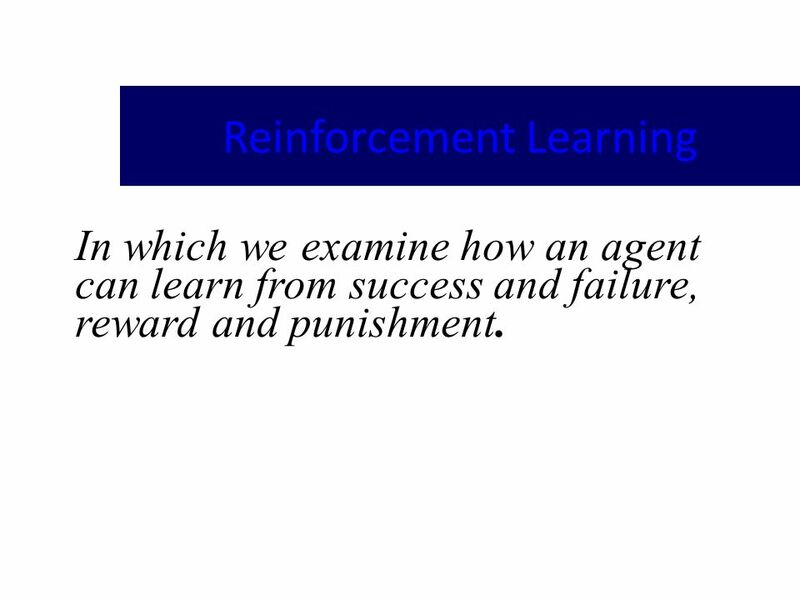 In which we examine how an agent can learn from success and failure, reward and punishment. 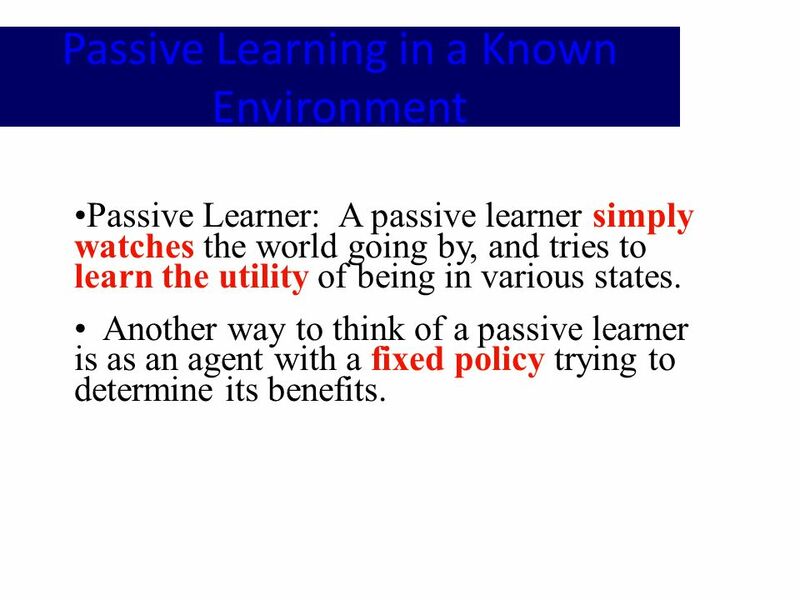 Passive Learner: A passive learner simply watches the world going by, and tries to learn the utility of being in various states. 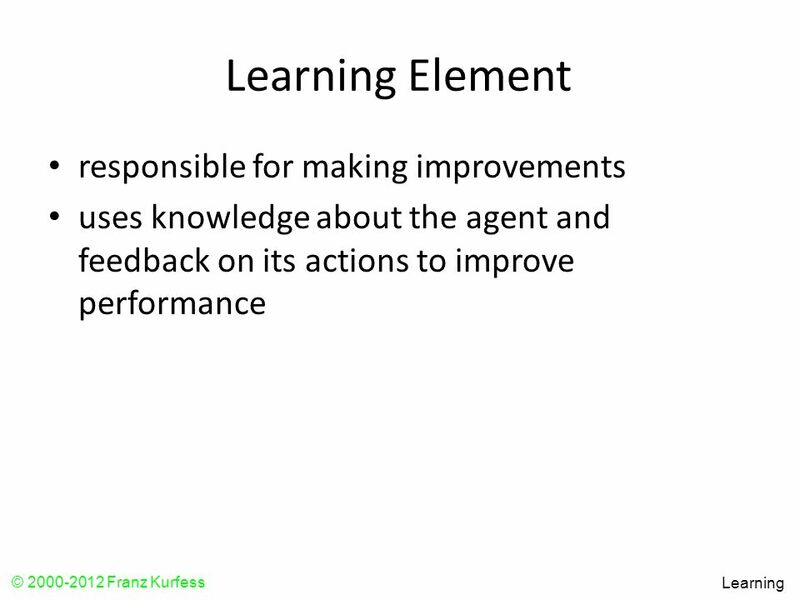 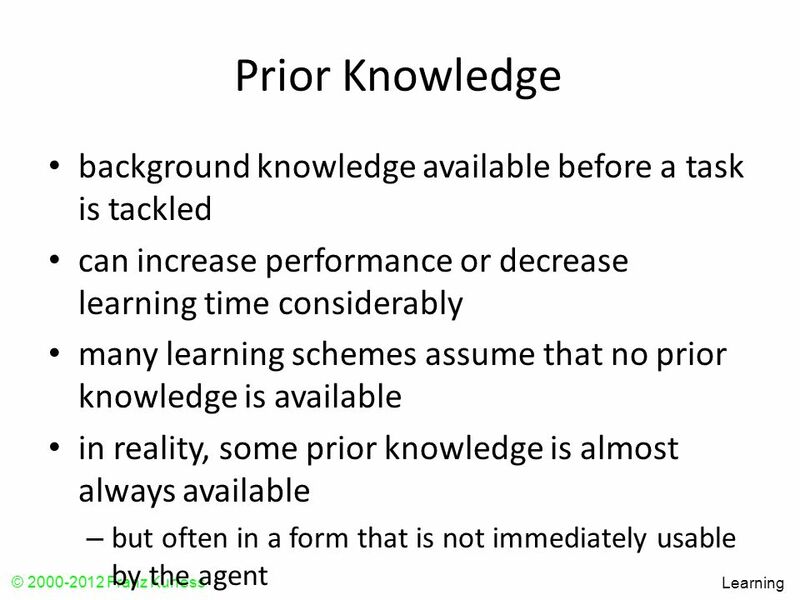 Another way to think of a passive learner is as an agent with a fixed policy trying to determine its benefits. 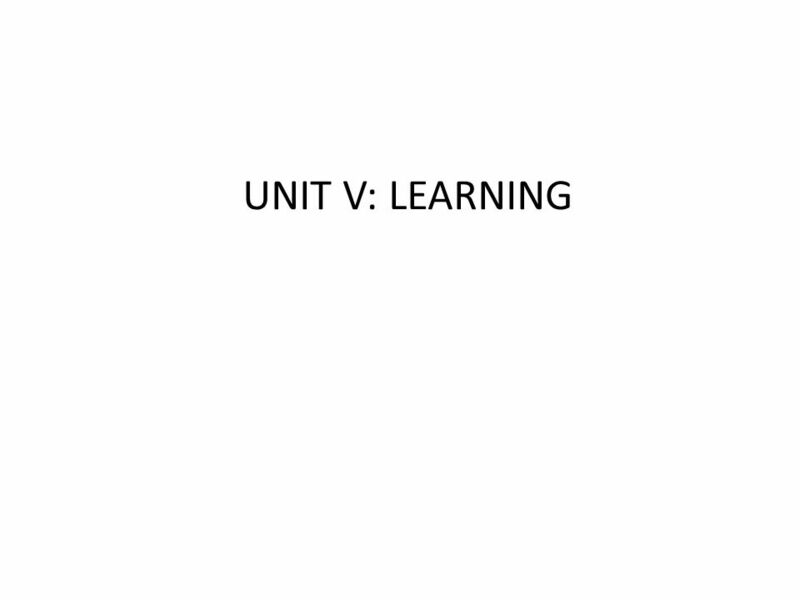 Download ppt "UNIT V: LEARNING." 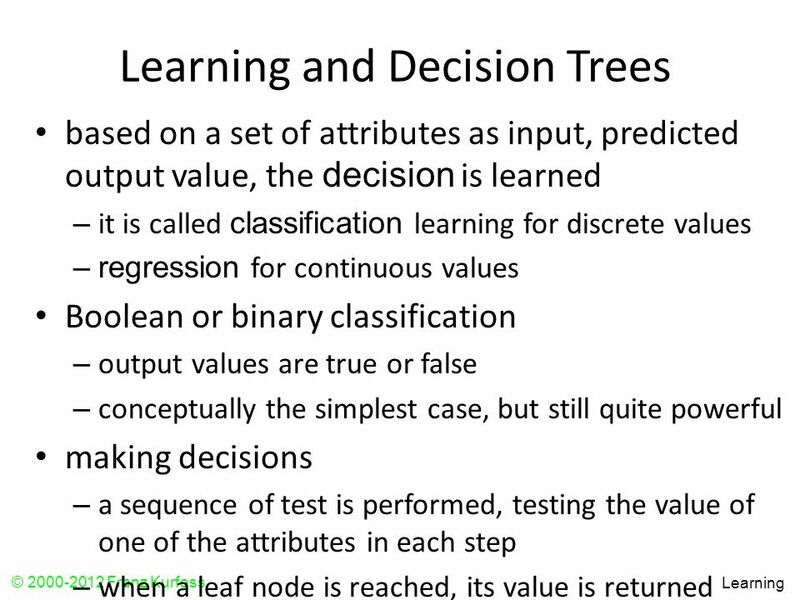 CSCI 5582 Fall 2006 CSCI 5582 Artificial Intelligence Lecture 20 Jim Martin. 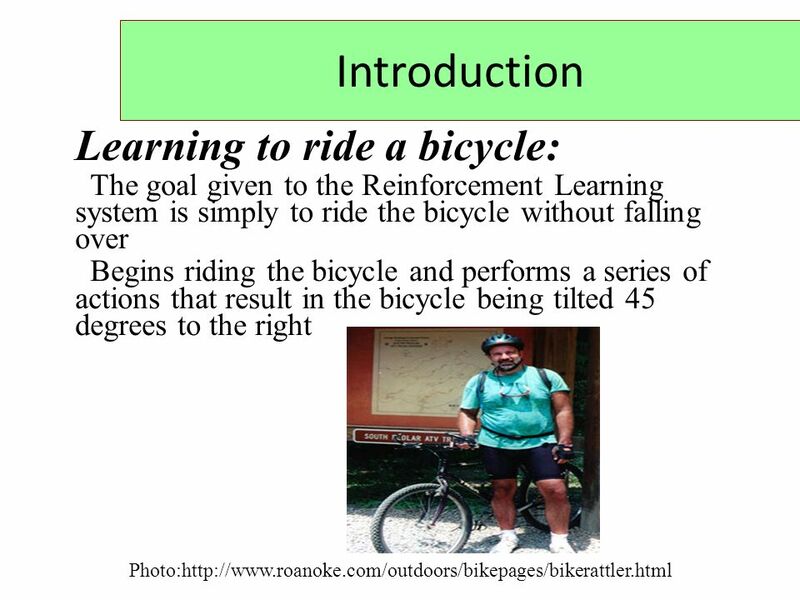 For Wednesday Read chapter 19, sections 1-3 No homework. 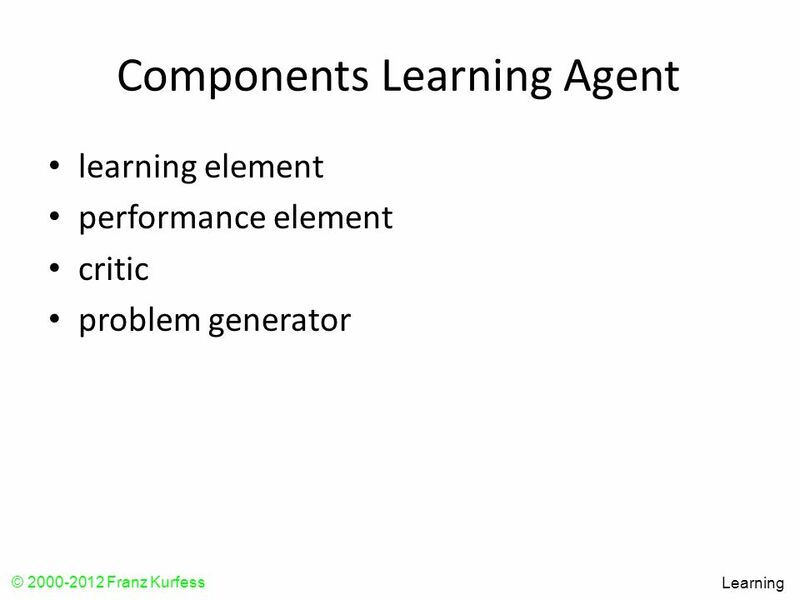 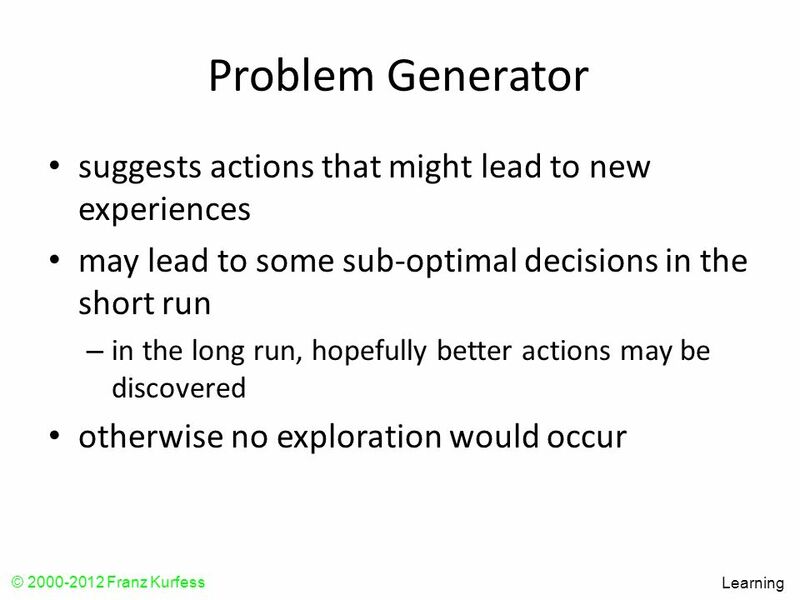 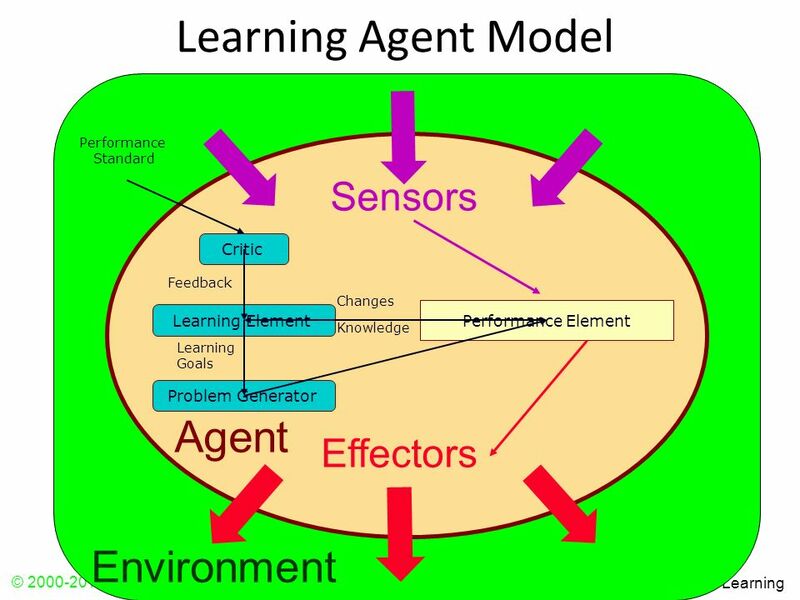 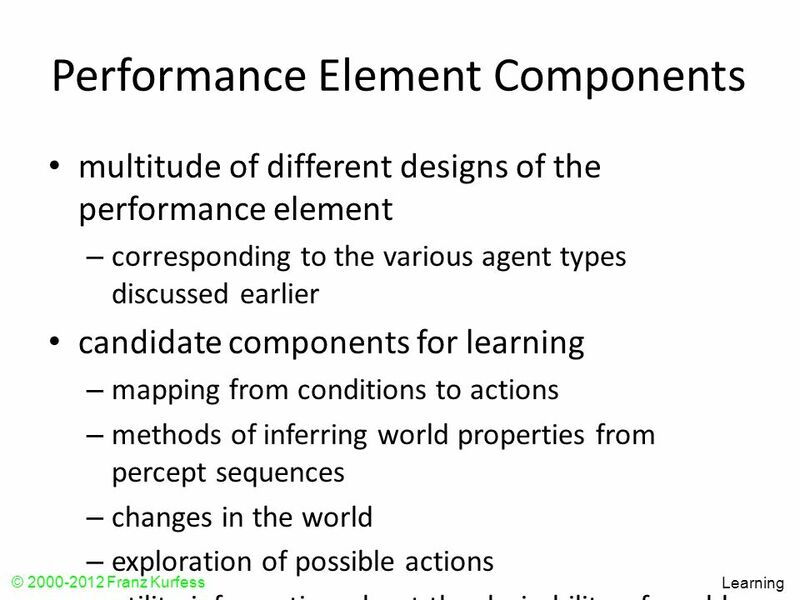 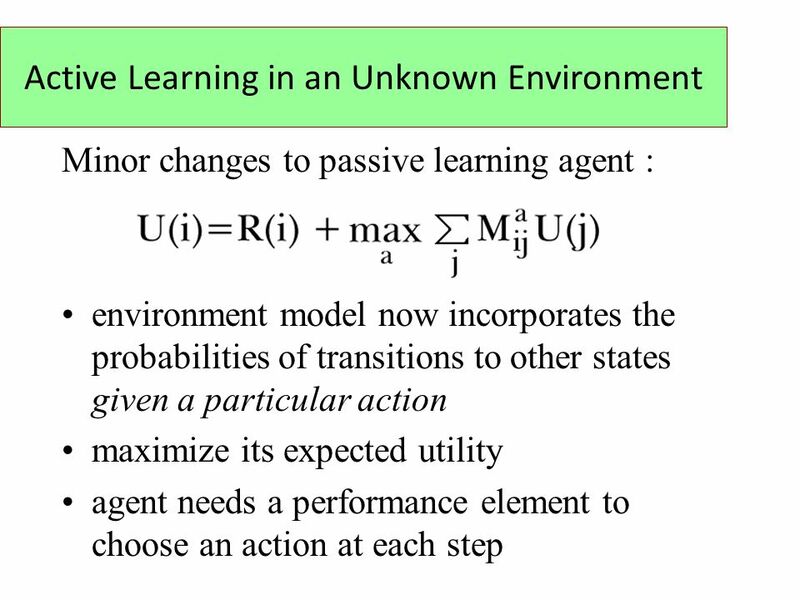 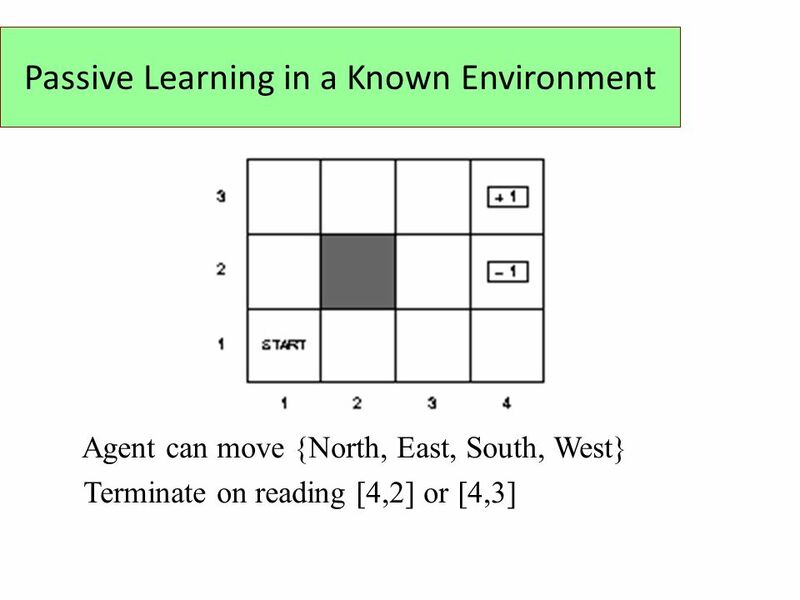 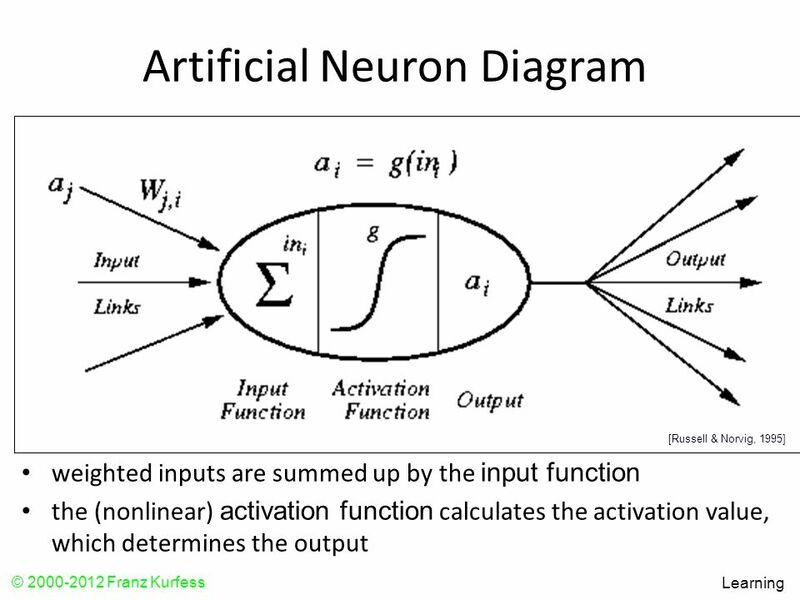 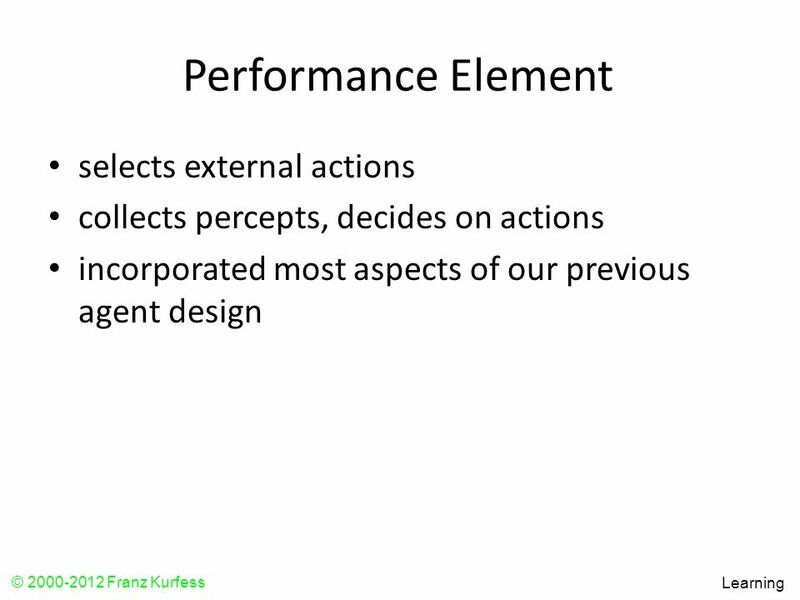 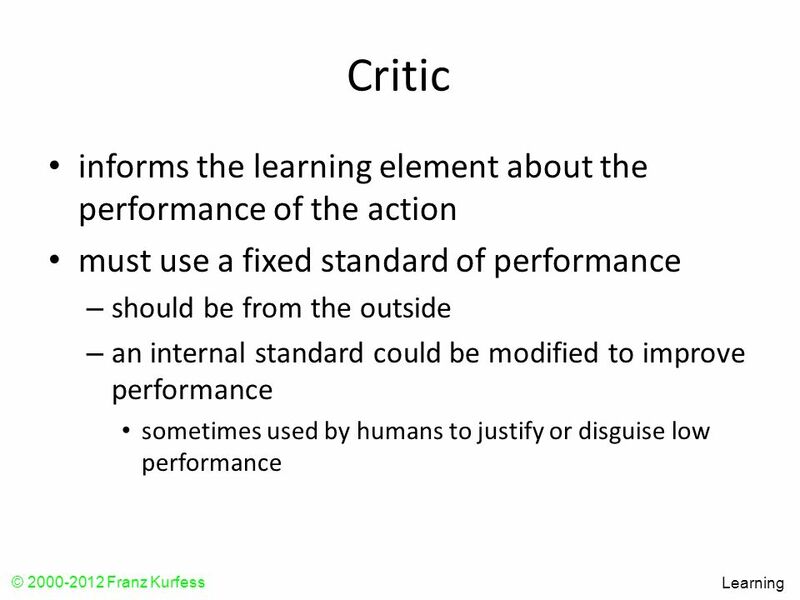 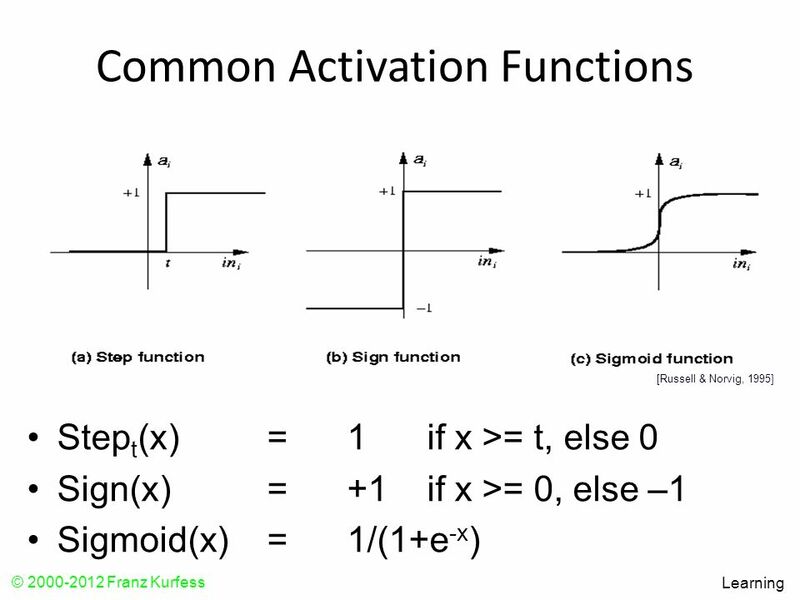 Ai in game programming it university of copenhagen Reinforcement Learning [Outro] Marco Loog. 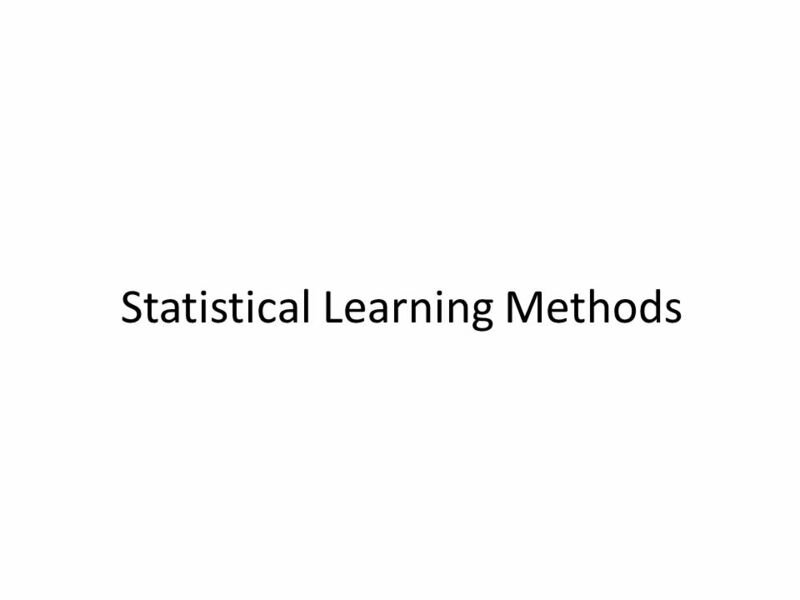 Statistical Learning Methods Copyright, 1996 © Dale Carnegie & Associates, Inc. Chapter 20 (20.1, 20.2, 20.3, 20.4) Fall 2005. 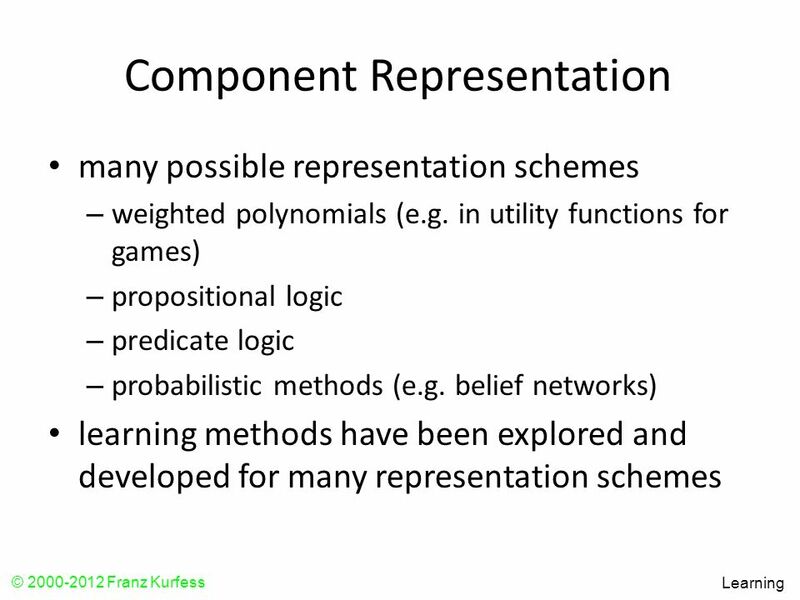 Ai in game programming it university of copenhagen Statistical Learning Methods Marco Loog. 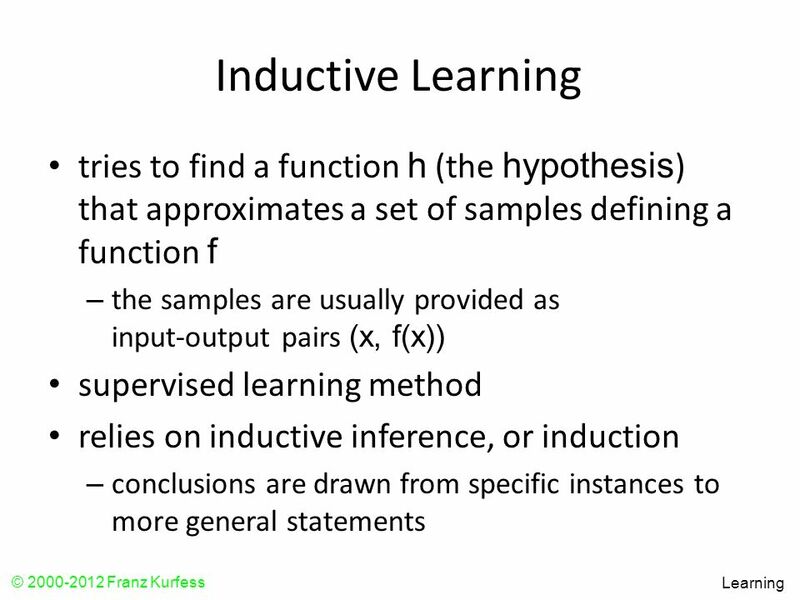 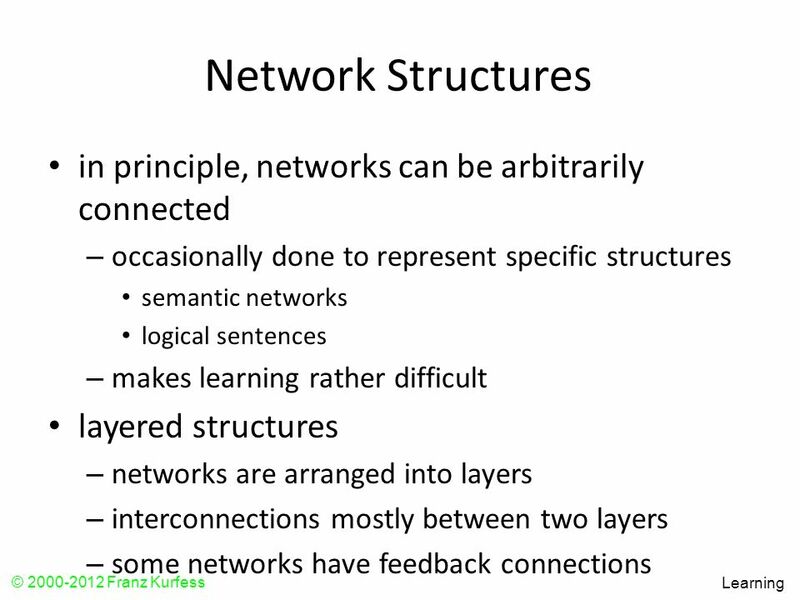 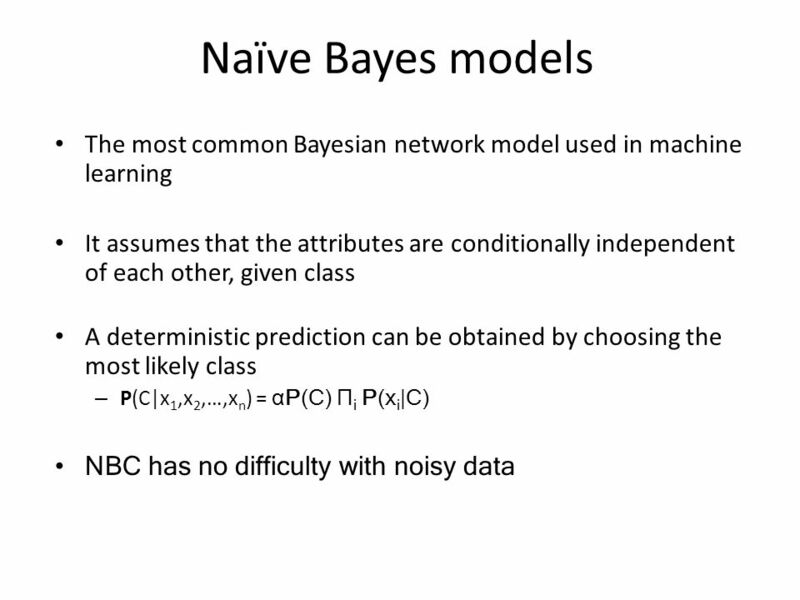 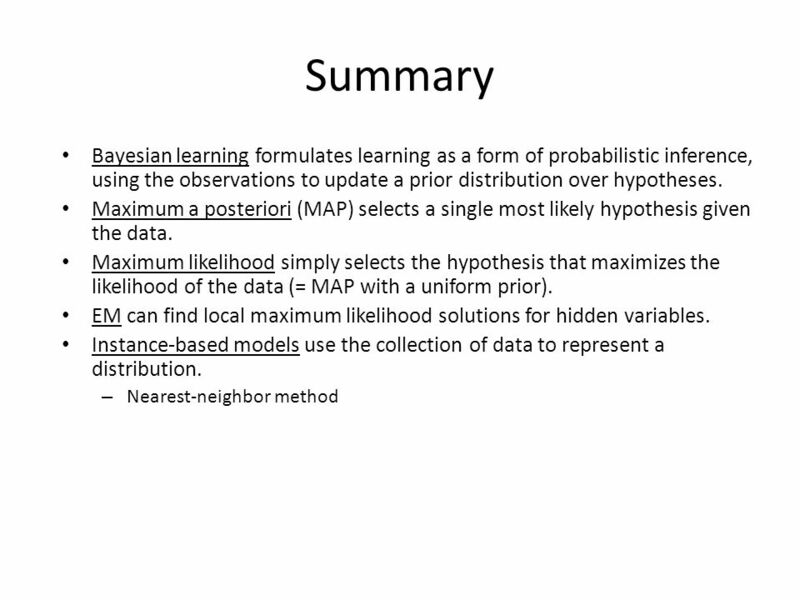 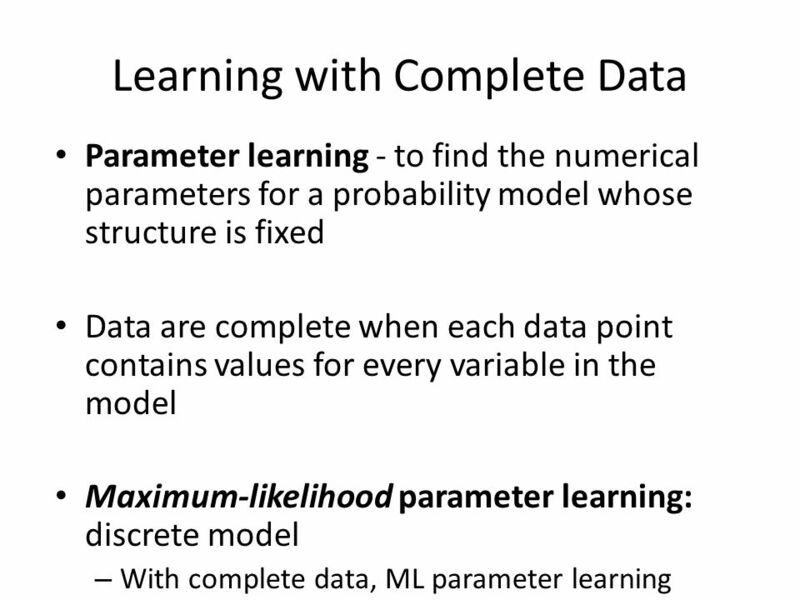 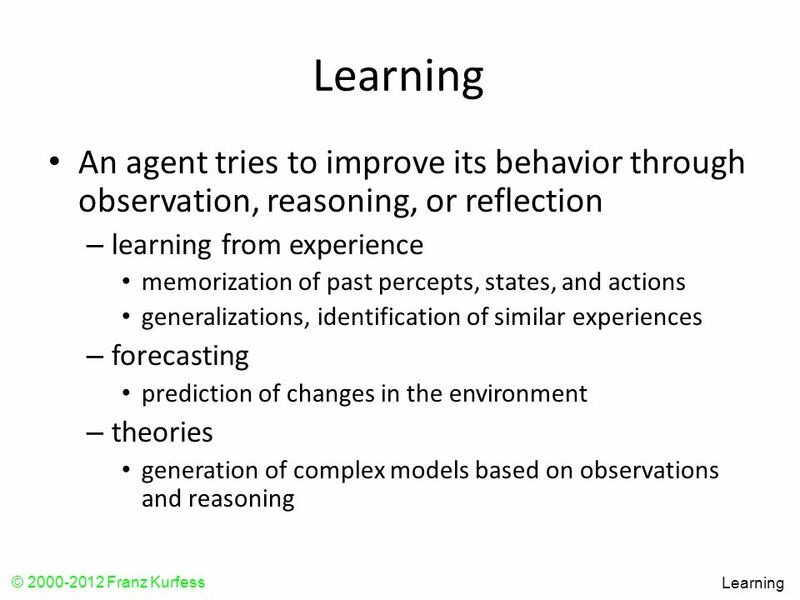 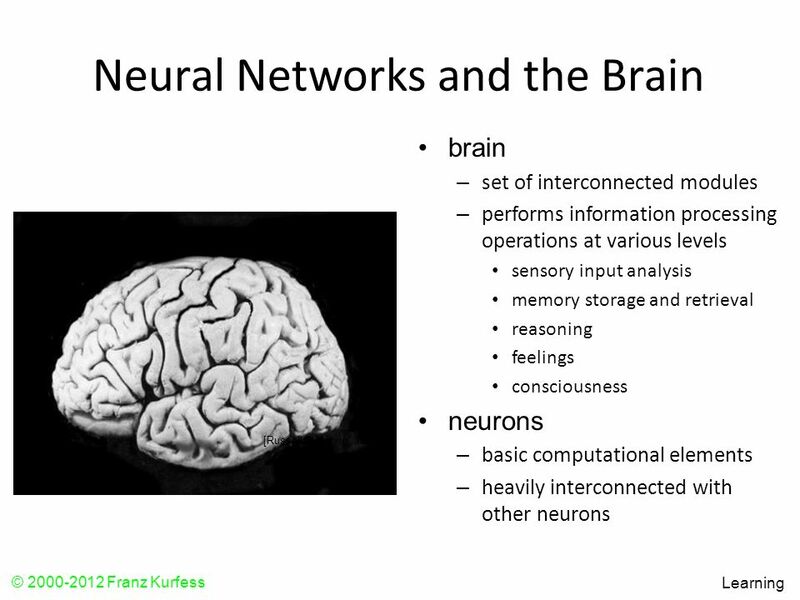 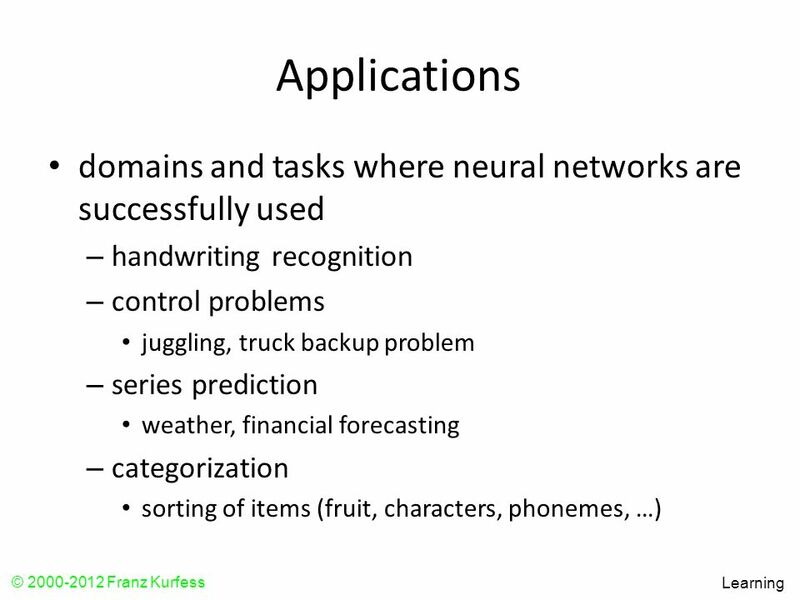 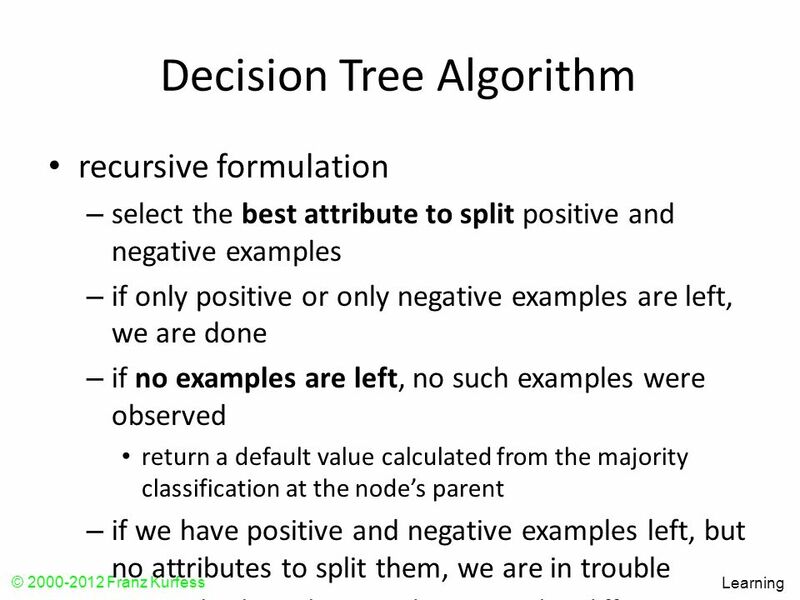 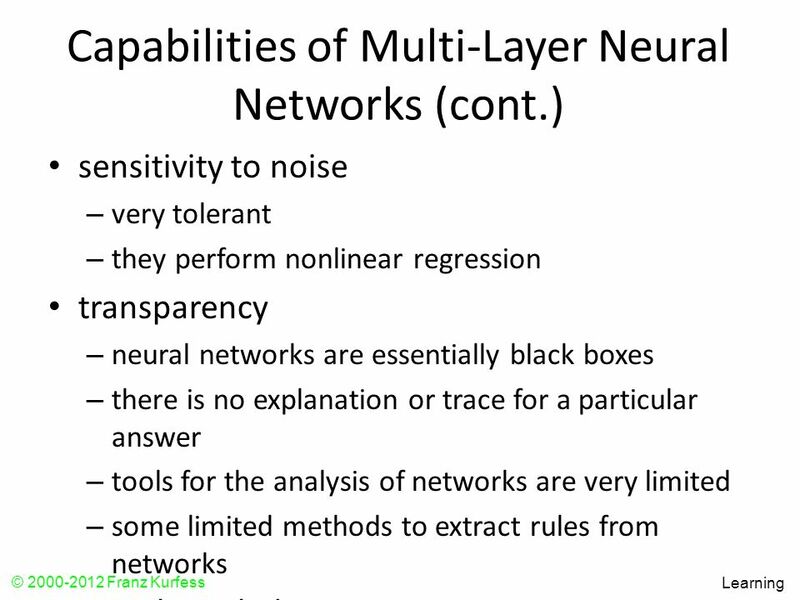 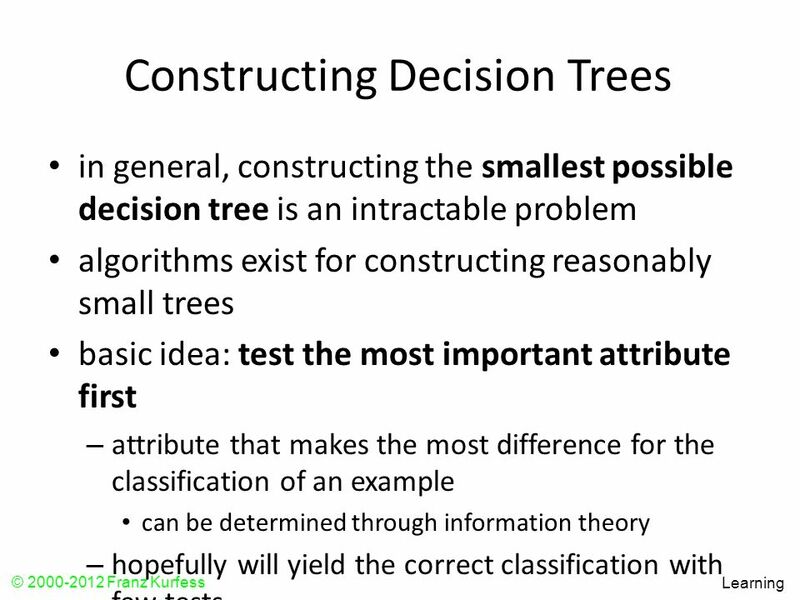 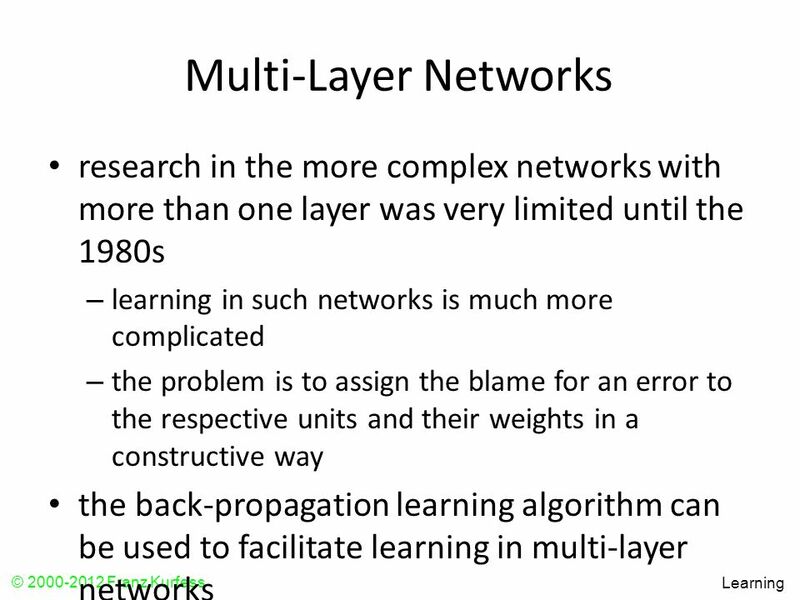 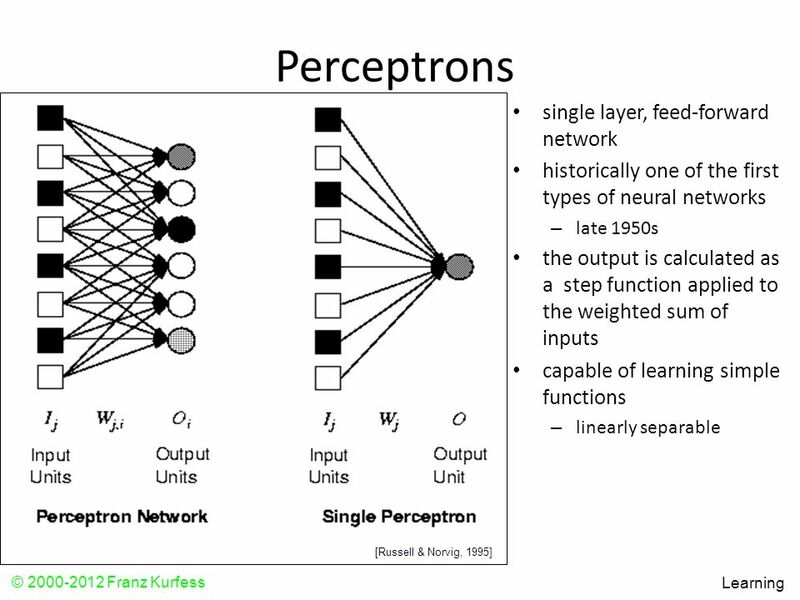 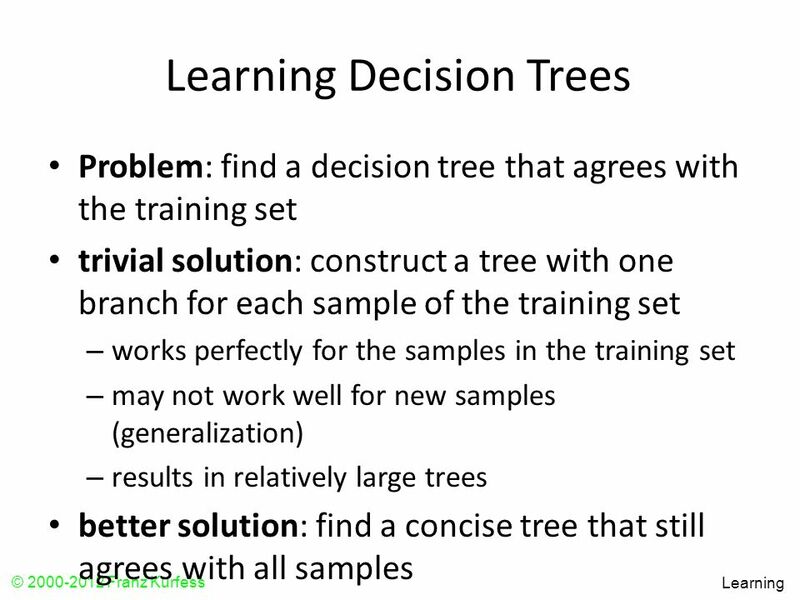 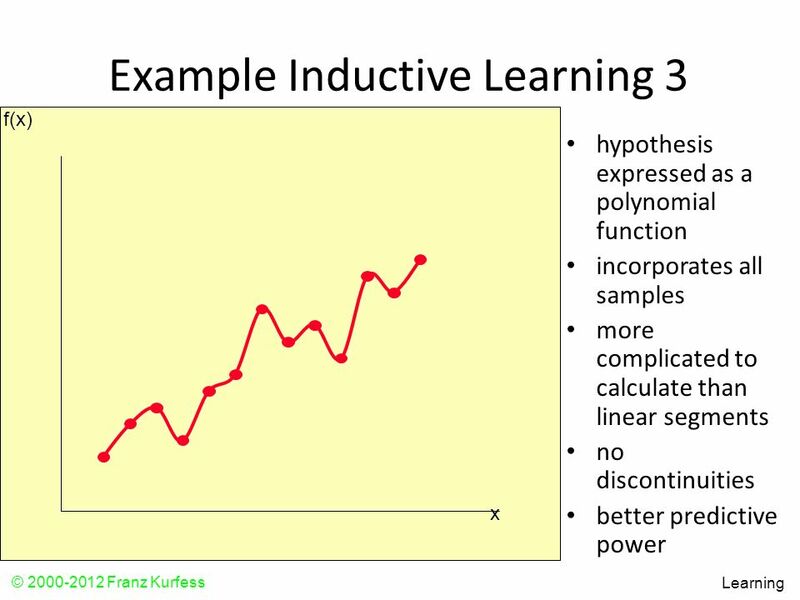 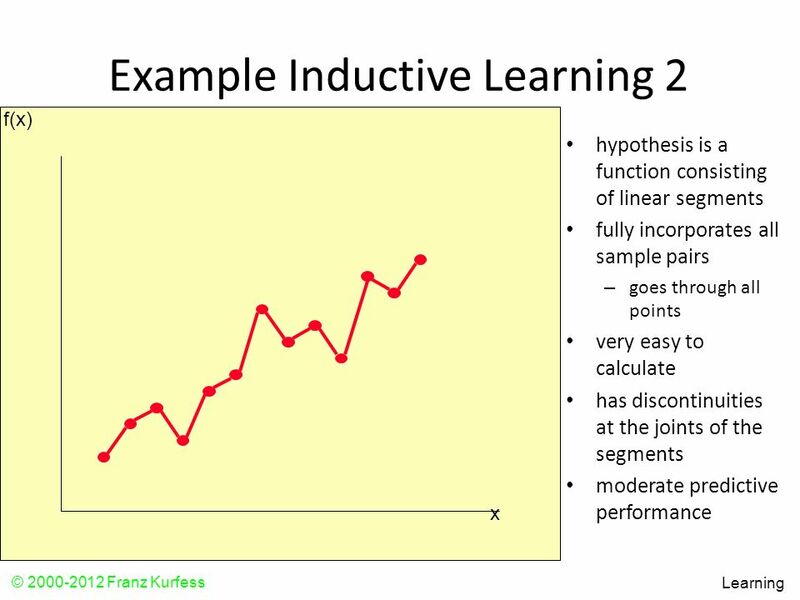 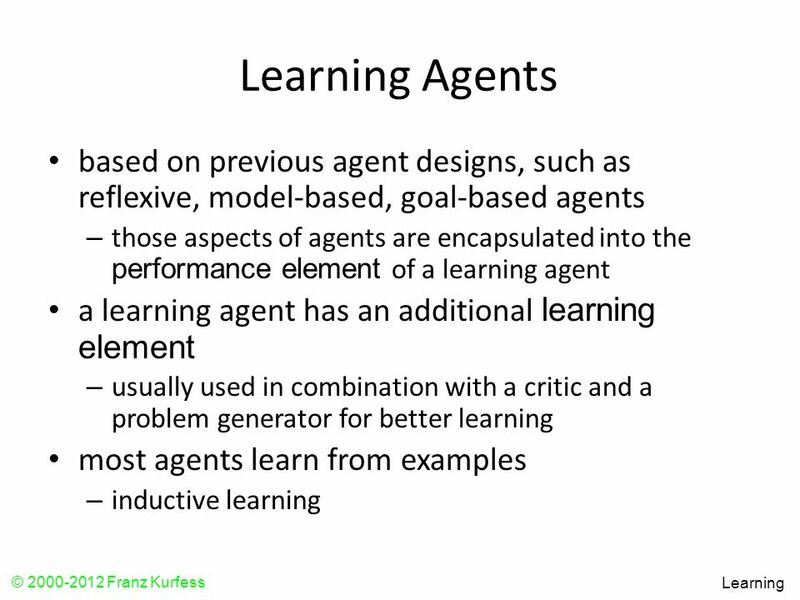 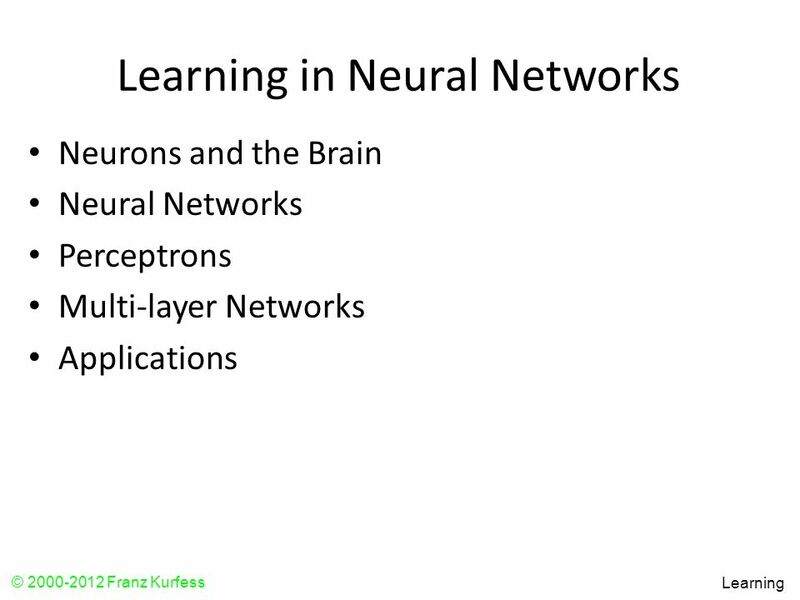 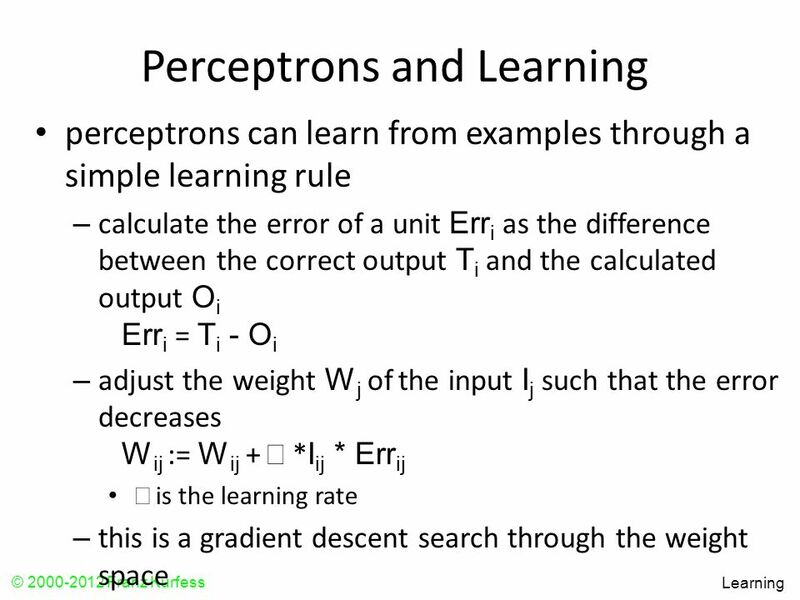 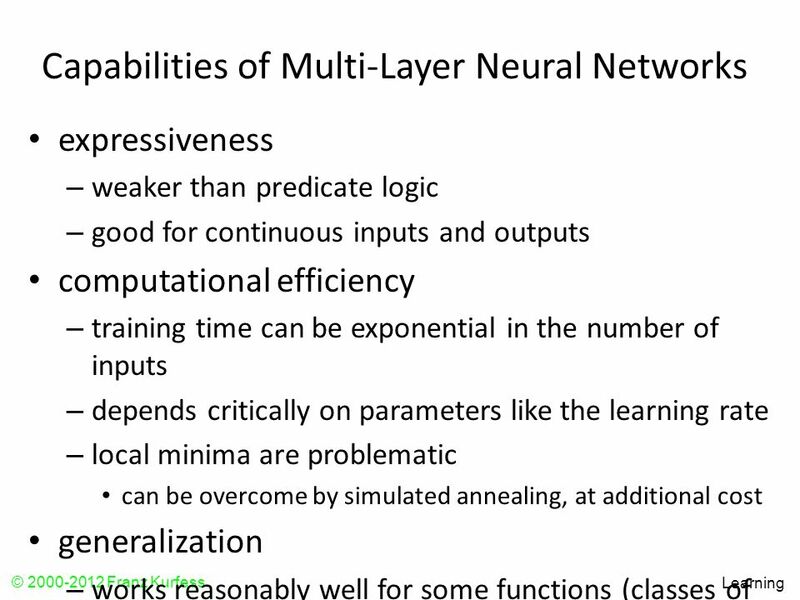 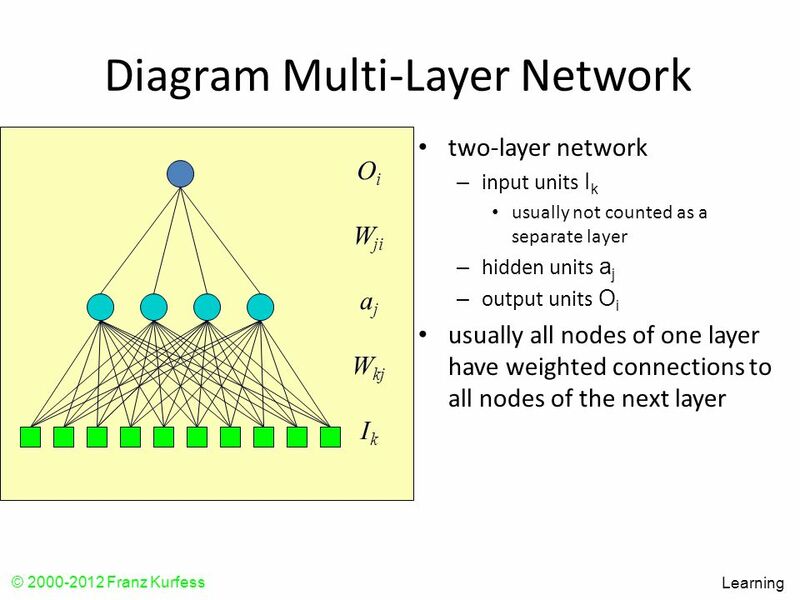 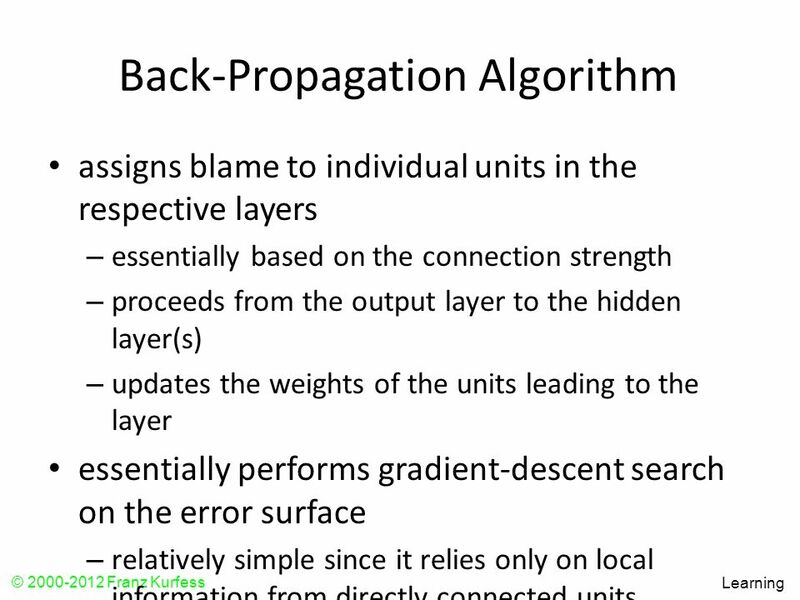 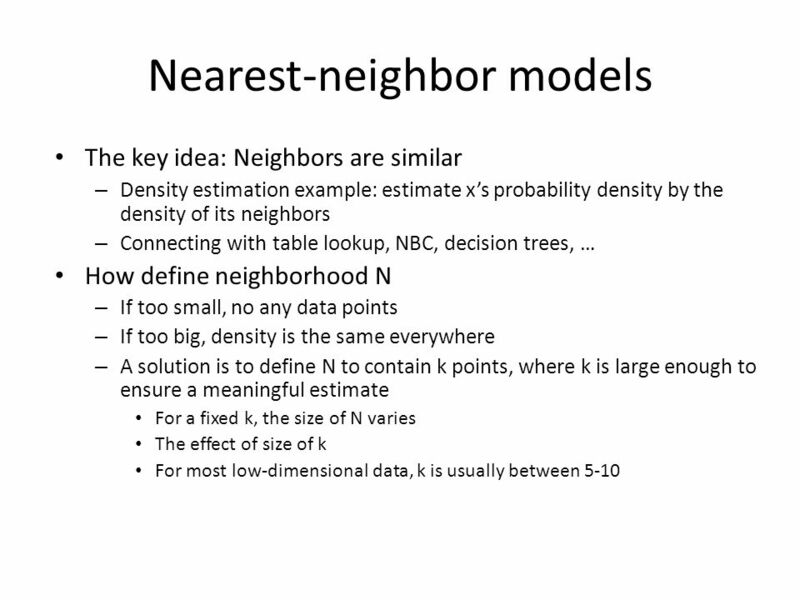 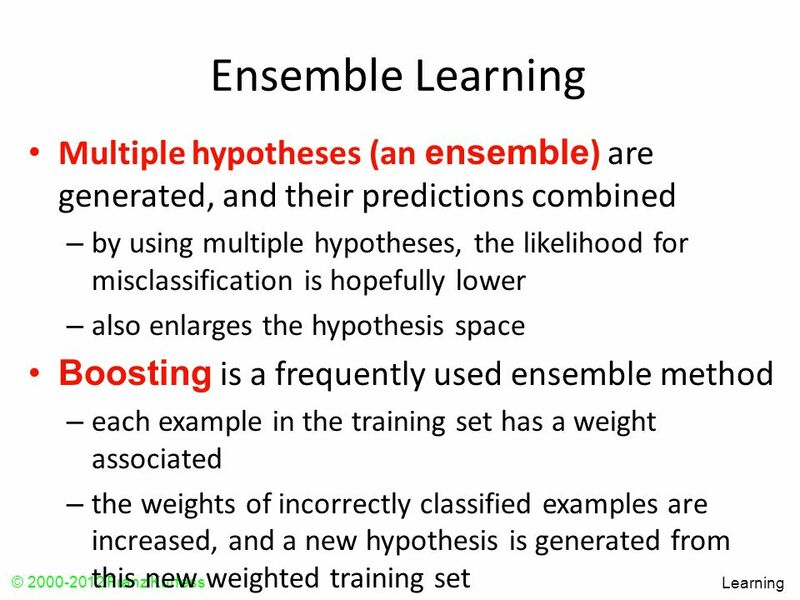 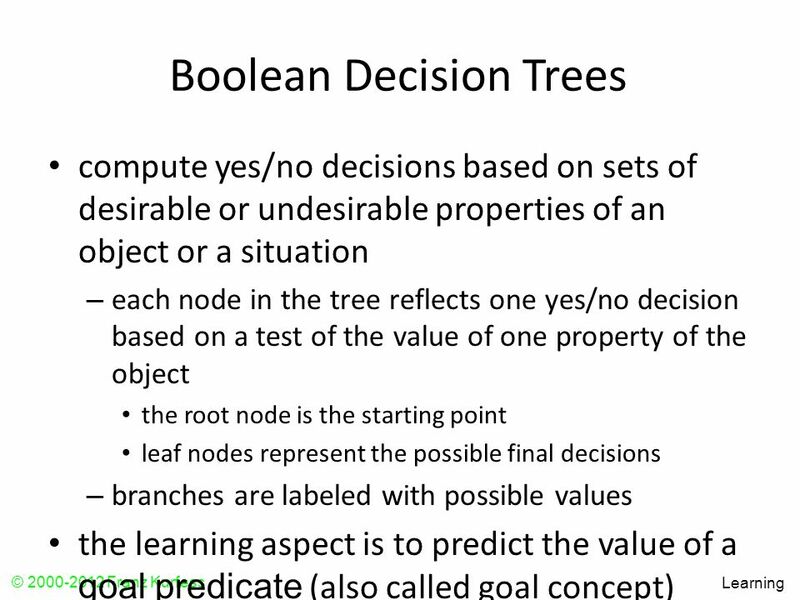 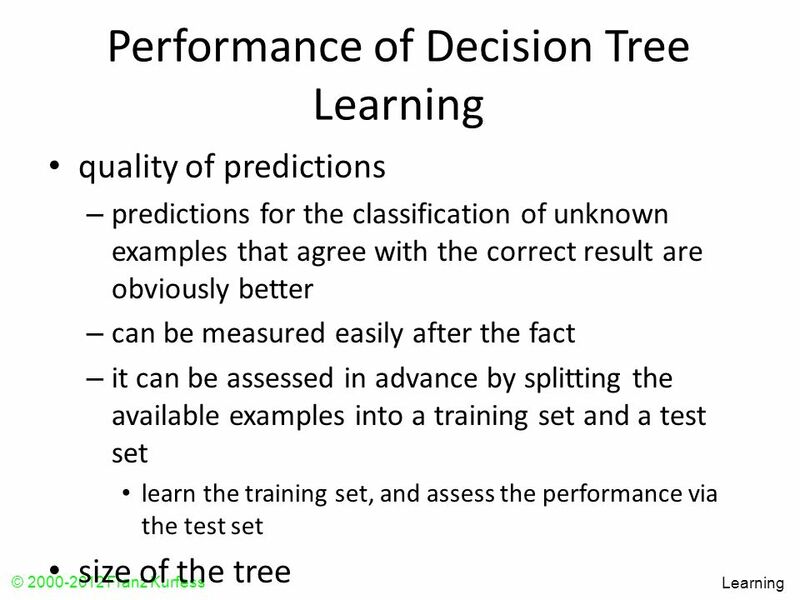 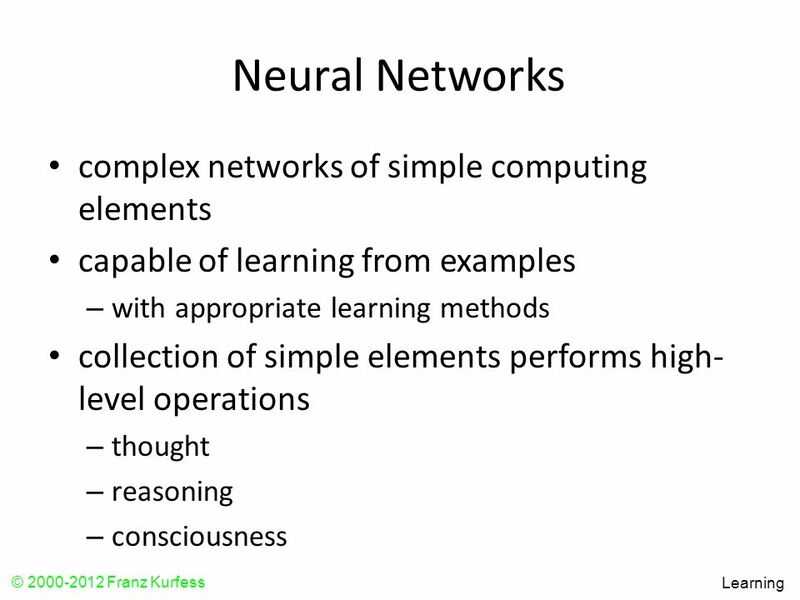 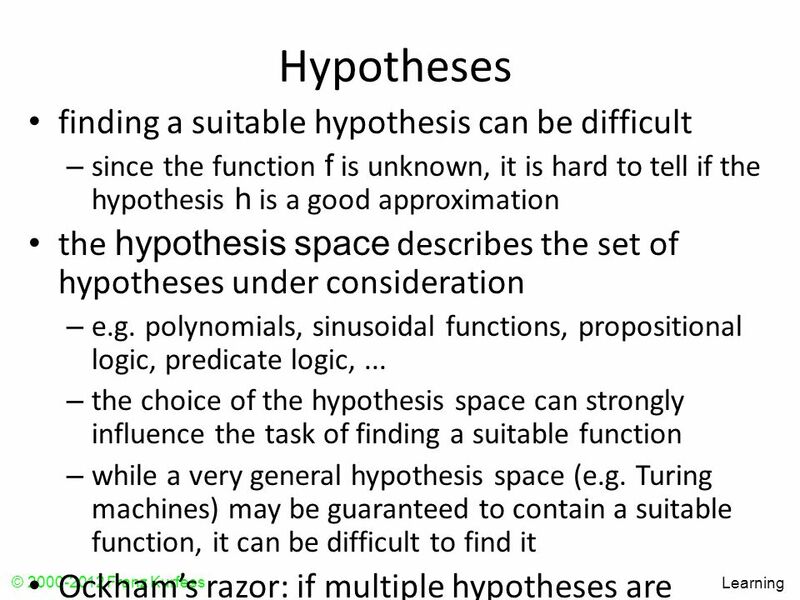 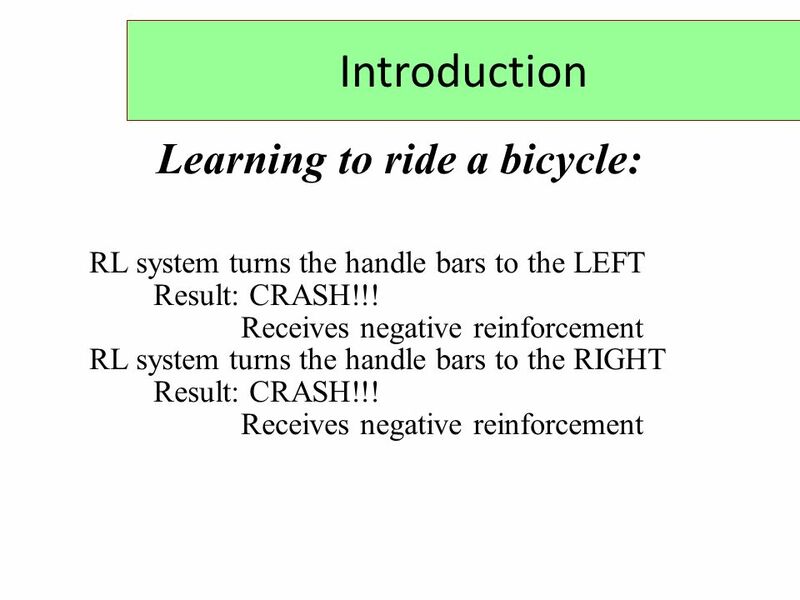 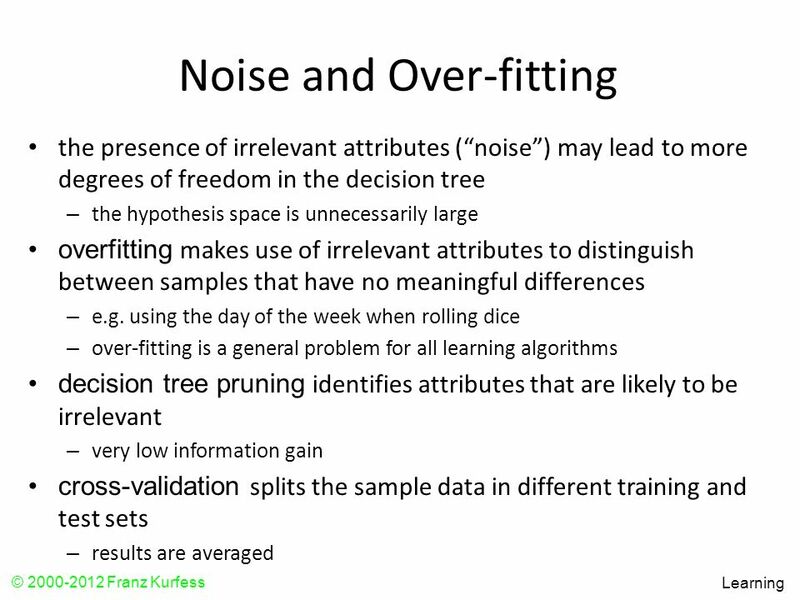 Lecture 17: Supervised Learning Recap Machine Learning April 6, 2010. 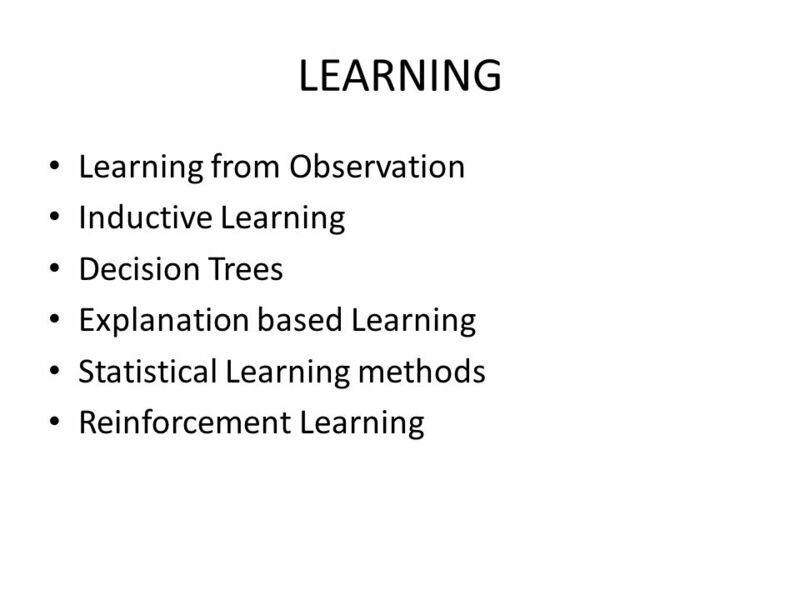 Learning from Observations Chapter 18 Through 18.3.5 1.